The International Monetary Fund has identified deflation as the biggest risk to economic recovery in the Euro Area. In its latest World Economic Outlook, the IMF said the Euro Area needs more monetary easing - including unconventional measures, such as quantitative easing - to sustain recovery and reach the ECB's inflation target of 2%. Last week ECB President Mario Draghi was critical of IMF managing director Christine Lagarde for urging the ECB to effectively print more money to head off the risk of deflation. But today's IMF publication contains numerous calls for monetary intervention from Frankfurt to deal with deflation. 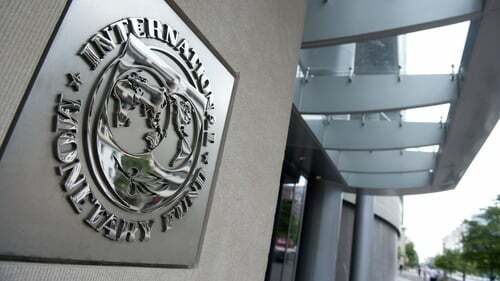 Overall the IMF said the global recovery is expected to strengthen this year, led by the advanced economies. It said that emerging market and developing economies will only grow modestly this year, adding that a worrying development is a downgrade of growth rates in some of the larger emerging market economies notably Brazil, Russia, South Africa and Turkey. It said the main risk to advanced economies comes mainly from "prospects of low inflation and the possibility of protracted stagnation, especially in the Euro Area and Japan". The IMF today forecast growth in the Euro Area of 1.2% this year, compared with negative growth of -0.5% last year. The US is forecast to grow by 2.8% this year, compared with 1.9% in 2013, aided by political agreement on correcting the federal debt and deficit, which will be less damaging to the economy. It said the biggest external threat to US growth is protracted sluggishness in the Euro Area economy "particularly if deflation dynamics take hold". The IMF said the recovery in the Euro Area is emerging pretty much as anticipated, with less fiscal drag from budget adjustments and a return of private sector investment for the first time since 2010 contributing to positive growth in the second half of last year. But the recovery is uneven across countries and sectors of the economy, it added. It said that substantial and persistent slack in the economy of the Euro Area had led to a general softening of inflation rates, which were already below the ECB's target of 2%. Financial fragmentation continues to disrupt monetary policy transmission, leaving firms and individuals in high debt, economically stressed countries like Ireland facing high market interest rates and shrinking private sector credit, it stated. A key risk to activity in the Euro Area stems from very low inflation, the IMF said. It said that "below target inflation for an extended period could de-anchor longer term inflation expectations and complicate the task of recovery in the stressed economies, where the real burden of debt and real interest rates would rise". The IMF also said that the Euro Area needs more demand support in the form of monetary easing by the ECB to help boost inflation back up the target level of 2%. It said this could take the form of further rate cuts and longer term targeted bank funding (possibly to small and medium size enterprises). Ireland is forecast to grow above the euro zone average, with growth this year of 1.7% and 2.5% in 2015, compared with the forecast for the Euro Area of 1.2% and 1.5% respectively. Irish unemployment should also fare better than the Euro Area average at 11.2% this year and 10.5% next year, compared to the euro zone figures of 11.9% and 11.6%. Meanwhile, China's economic growth will slow to 7.5% this year and 7.3% in 2015, the IMF said today, unchanged on its last forecast. The world's second-largest economy will avoid a "hard landing" if the government addresses simmering risks and carries out needed reforms, the Fund said in its World Economic Outlook report. The IMF cut its 2014 growth forecast for Japan and warned that Prime Minister Shinzo Abe must follow through on promised reforms to cement a turnaround in the world's third biggest economy. Japan's economy is set to grow 1.4% this year, down from an earlier 1.7% forecast, before slowing to 1% in 2015. The IMF today cut its growth forecast for Russia following Moscow's takeover of Crimea and warned the Ukrainian crisis could have much wider global knock-on effects. The Ukraine crisis and the ensuing diplomatic confrontation between Moscow and Western powers have already plunged Ukraine into a deep recession and prompted major capital outflows from Russia after Washington slapped targeted sanctions against Moscow. The IMF cut its GDP growth forecast for this year for Russia to 1.3% from 1.9%, blaming "emerging market financial turbulence and geopolitical tensions relating to Ukraine on the back of already weak activity." The IMF said Ukraine's output would "likely drop significantly as the acute economic and political shocks take their toll on investment and consumption." The Ukrainian crisis could have effects beyond the former Soviet Union, it also warned. "Greater spillovers to activity beyond neighbouring trading partners could emerge if further turmoil leads to a renewed bout of increased risk aversion in global financial markets, or from disruptions to trade and finance due to intensification of sanctions and countersanctions," the Fund said. "In particular, greater spillovers could emerge from major disruptions in production or the transportation of natural gas or crude oil, or, to a lesser extent, corn and wheat," the Washington-based organisation said. Currently Western sanctions target some of Russian President Vladimir Putin's top allies and the Bank Rossiya, a lender described as a "crony bank" for Russian elites. The US has pledged to target the broader Russian economy if the Kremlin intervenes in eastern Ukraine where pro-Moscow activists have over the past few days seized government buildings and vowed to vote on splitting from the ex-Soviet country. Such measures could isolate entire sectors of the economy in Russia, the world's leading oil producer, the largest supplier of gas to Europe and the world's third largest exporter of grain.